Before the advent of seamless gutters in the 1960s, the retrofit market was dominated by sectional steel gutters that were first installed and then painted in situ. In time, of course, the paint peeled, the steel rusted, and the gutter had to be replaced. The common reasons cited for the rise of seamless gutters are the introduction of roll-forming machines and the superior rust-resistance of aluminum. But then, who would want a shiny band of aluminum ringing the entire perimeter of their home? To be a viable product, the aluminum would have to be painted. But how do you paint a strip of metal that will be wound up in a coil and then run through a machine that presses the aluminum into a new shape? And if you had to paint the gutter after it was installed on the house, then seamless aluminum would be little better than sectional steel. 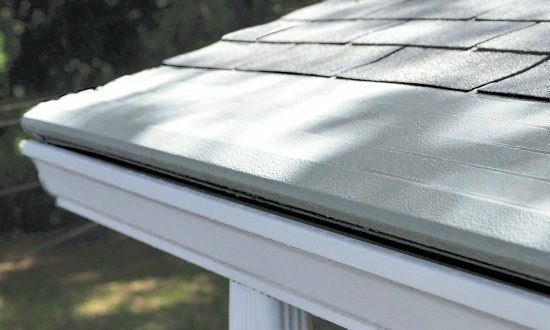 Thus seamless gutters were actually made possible by the development, in the early 1960s, of vinyl gutter colors and paints that could be applied to aluminum. Because vinyl is flexible, the painted aluminum could be coiled, rolled, and stamped right along with the underlying metal. Further, the stage was set for producing aluminum seamless gutters in a wide variety of colors. But not all paints are alike. Vinyl got the ball rolling, but manufacturers soon found the coating would quickly chalk and fade. In the late 1960s the industry developed polyester paint systems with an epoxy primer, a product that remains a standard today. Over the past 40 years even longer-lasting paints have been developed, including silicone polyester and polyvinylidene fluoride (best known by the trade names Kynar® and Hylar®). Yet there’s a tradeoff. The newer paints hold their colors longer, but they cost more. Therefore the higher-end paints have gravitated to the commercial construction market, while polyester remains the norm for the residential market. Polyester paint is applied to metal in a baked-on enamel process and believed to offer the longest-lasting color for the prices that consumers are willing pay. The proliferation of gutter colors, however, can be a two-edged sword. More colors allow gutter systems to be better matched with the roof color and other exterior details of your home. But if your gutter installer gets various components—gutters, downspouts, elbows—from different sources, then colors can fade at different rates and produce a “two-tone” effect.